Authentic OEM Nintendo NES Power Supply Original AC Adapter Tested Working. Condition is Used. Shipped with USPS First Class Package. 100% Authentic OEM Nintendo item in good used condition. No fraying to wiring. May have purely cosmetic signs of previous handling on the power block area with chips, tape, paint residue, etc. Fully tested to work perfectly! 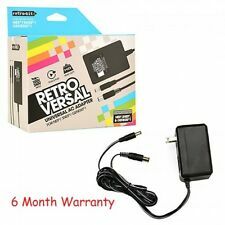 Power Supply AC Adapter for Nintendo NES, Famicom, Super Famicom, Disk System. This is a new high quality, low noise power adapter for Nintendo Famicom, Famicom Disk System, NES, Super Famicom and more. These modern power supplies have been tested interference free on original Famicom consoles, as well as on the NES-101 toploader system, which both connect to TVs only through RF output. In used condition will have blemishes and scratches, tested and works. If you use a DC out AC you will ruin your NES system! 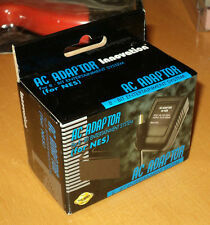 Input AC 110v 60 hz Output AC 9 volt 1300 ma. Original AC is 9 volt AC out not DC out! Also if you are buying those DC 9volt output beware! Those blow up your system. 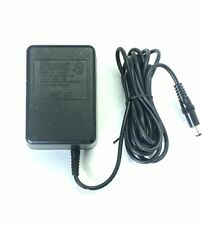 Authentic OEM Nintendo NES Power Supply Original AC Adapter Tested Working. Condition is Used. Shipped with USPS First Class Package. 100% Authentic OEM Nintendo item in good used condition. No fraying to wiring, but one of the pins on the power block is slightly bent. Fully tested to still work perfectly! Authentic OEM Nintendo NES Power Supply AC Adapter Tested Working Wiring Frayed. Condition is Used. Shipped with USPS First Class Package. 100% Authentic OEM Nintendo item in very rough used condition. The wiring is frayed in multiple areas, but has fully been tested to play perfectly regardless of the appearance. Selling at a discount due to cosmetic blemishes. Platform: Nintendo NES & SNES & Sega Genesis Version 1. 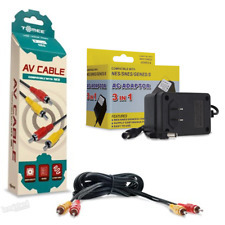 Replace lost/broken standard power cable with the NES/SNES/Sega Genesis Version 1 Cable Power Adapter. We will do our best to resolve any problems that may arise. OEM Official Nintendo NES AC Adapter Power Supply NES-002 - Authentic (untested). Condition is Used. Shipped with USPS Priority Mail. I will be happy to assist with any issues. NO EXCEPTIONS. 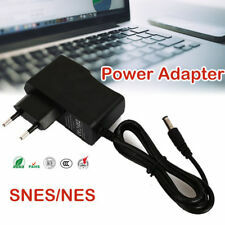 3-In-1 US Plug AC Power Adapter Cable For NES Super Nintendo SNES Sega Genesis. 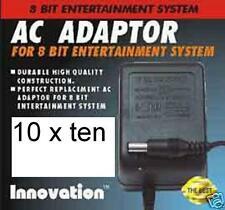 Compatible with: Nintendo NES, Super Nintendo SNES, Sega Genesis 1. 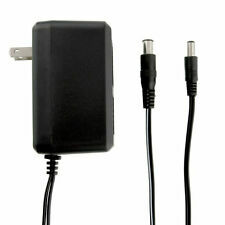 AC adapter works with Nintendo NES Super Nintendo & Sega Genesis consoles. Will not work for 220V outlets. NON CONTINENTAL USA AK / HI / PR / APO / FPO / & OTHER US TERRITORIES. SNES Super Nintendo 16 bit system. NES Nintendo 8 Bit Systems. Sega Master System 1 System. Trending at $13.94eBay determines this price through a machine learned model of the product's sale prices within the last 90 days. Platform: Nintendo NES & SNES. Replace your lost/broken standard power cable with the NES/SNES Cable Power Adapter. We will do our best to resolve any problems that may arise. Included:10 Power Adapters. This is an original OEM Nintendo NES AC Adapter: Model No NES-002. It has been tested and works perfectly. Made in Japan. 3-in-1 AC ADAPTER. Output: DC 9V, 850mA. Specification: 100% brand new with high quality Material: Plastic Metal Color: Black Size: Approx.7.8x5.3x4.7cm/3.08x2.09x1.85in Cable Length: Approx.1.43m/4.69ft Plug Type: US plug Input: 110-240V 60Hz Output: DC 9V 850mA Compatible with: Nintendo NES, Super Nintendo SNES, Sega Genesis 1 Quantity: 1Pc (other accessories demo in the picture is not included) Stylish, lightweight and compact design. Made of plastic, metal material, sturdy and durable. AC adapter works with Nintendo NES Super Nintendo & Sega Genesis consoles. Please note that this AC adapter is not compatible with Sega Genesis 2 & 3 models. 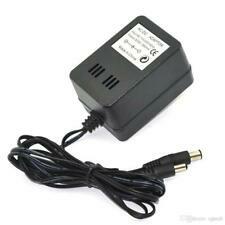 Package Included: 1 x AC Power Adapter Cable Note: Please allow minor error due to manual measurement. The colors may be a little difference for the different monitor display. This for SNES adapter has simple plug and play functionality to get your retro console back up and running again. Compatible with both the for Super NES as well as the original for NES consoles. Easily power your device through a power outlet Simply plug the data cable into the plug. NES and SNES consoles. Bank Deposit, Money Orders. Can be use on. Nintendo NES-002 AC Adapter Power Supply Cord NES OEM Tested Working Order!! !